What do you do when the old workshop you’re housing your truck in suddenly stops becoming fit for purpose? You turn it into a new bar of course… well at least if you’re Matt Holdsworth, owner of The Bhaji Shop. A joint venture between Matt, his sister Melissa and Beer Engine owner Tom Harrington, The Old Workshop had been taken on by the trio originally to house the Bhaji Shop’s Thali truck used for outdoor events. But when Tom, who is an old school friend of Matt’s had the bright idea of levelling the sloped floor, it meant they could no longer get the truck in, which is when Matt struck upon the idea of opening a bar instead. 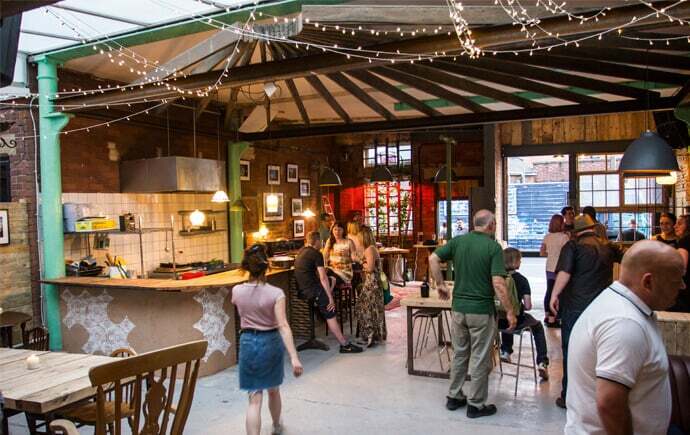 Located in the heart of Neepsend, alongside the likes of Peddler Market and Yellow Arch studios and just a couple of minutes’ walk from the burgeoning Kelham Island eating and drinking scene, The Old Workshop is a perfect complement to Matt and Tom’s other ventures. Capturing the charm and home spun vibes of the Bhaji Shop alongside an insightful list of ever-changing craft beers (there’s 7 draft lines and 25 bottles) and an excellent array of gins, rums and wines courtesy of Tom, it’s a fusion of the two businesses strengths. 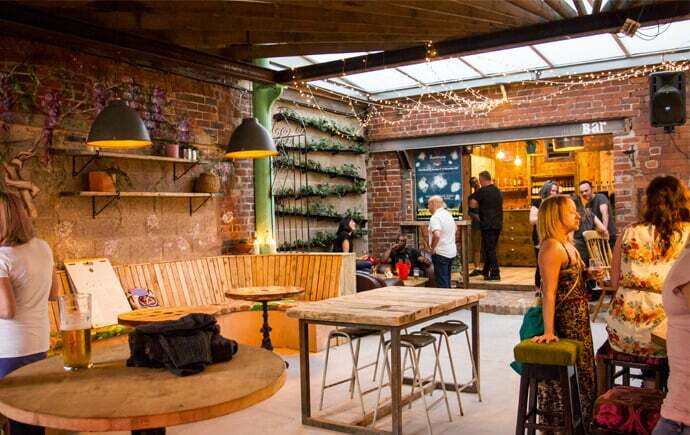 There’s artwork from artists HINEink and Fem Sorcell complementing the wooden panelled walls and exposed brickwork, alongside fairy lights, low slung individual pendant lighting and lots of flora and fauna. 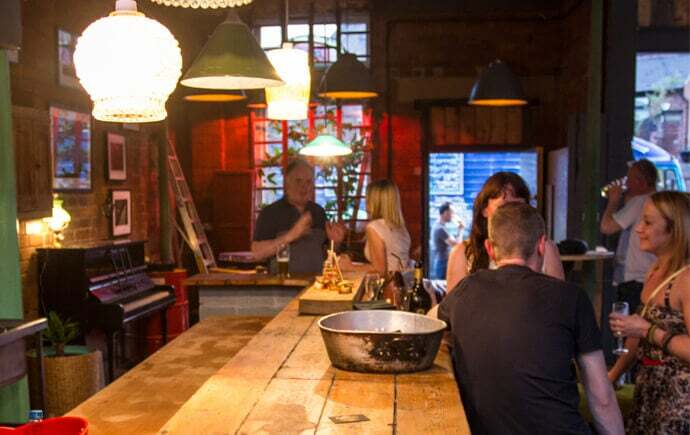 Alongside beers from breweries such as Magic Rock, Brew By Numbers, Dark Star, The Kernel, Wild Beer, Tiny Rebel and Green Flash, there’s a ‘live’ kitchen making pinchos (small bar snacks made popular in Northern Spain) as well as an in-house piano, while regular DJ nights and occasional acoustic nights will also be on the menu. “The bar is very much Matt’s vision – that’s what he’s really good at – but I know more about beer, so it’s a match made in heaven,” says Tom. After launching last night (Wednesday June 16) with a ‘thank you’ event for all those who helped bring the Sheffield Food Festival to town last month, there’s an invite only event for friends and family tonight before the launch to the general public on Friday. There’s also an event space for hire upstairs while in the future they plan on bringing in a lunch menu on Sundays. The Old Workshop is open Wednesday to Saturday from 4pm-12am and Sunday from 2pm-11pm. Find them on Facebook here or in person at Hicks Street.